Kelp (Laminaria) is a word used to describe a type of brown seaweed that usually grows in large underwater forests. While seaweed can grow in nearly any type of saltwater or freshwater, kelp is found only in saltwater, usually along nutrient-rich, cold, rocky coastlines. There are about 30 different varieties of kelp. Kelp provides nutrition for a wide range of sea life. Many people also consume the leafy food because kelp benefits are widely promoted in health food circles and around the world. 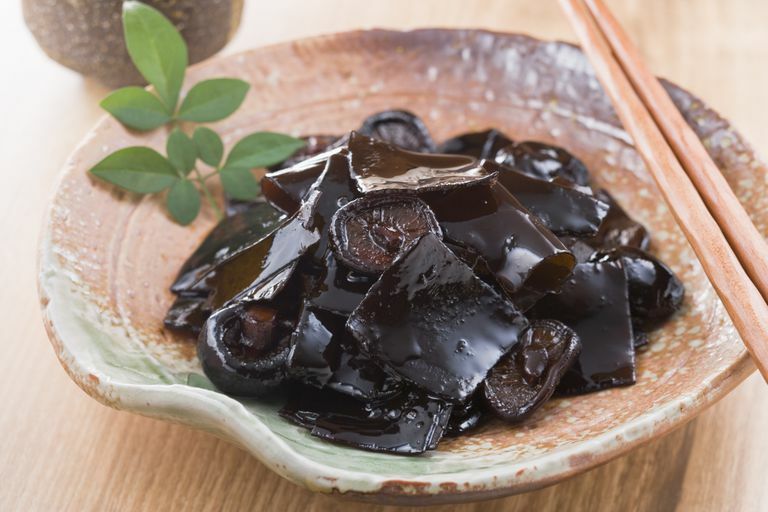 Kelp—along with other types of edible seaweed—has been a staple in the Japanese diet for hundreds of years. The food is now becoming popular in other parts of the world, due in part to the popularity of kelp noodles. Raw kelp provides very few calories. A 100-gram serving of kelp (about 2/3 cup) provides about 43 calories, according to USDA data. But kelp is usually not consumed raw as a stand-alone food. The way that you include kelp in your meal will determine the total number of calories you consume. For example, if you eat kelp noodles, nutrition facts will vary based on the product that you buy or the recipe you use. In general, however, the ingredients include just kelp, water, and sodium alginate (a natural hydration agent that is extracted from brown seaweed). If you buy a brand that includes just those ingredients, there are fewer than 10 calories in kelp noodles per serving. But kelp noodle calories can be slightly higher if you buy packaged products with other ingredients. For instance, some companies sell kelp noodles with mixed sea vegetables or kelp noodles with konaberry (the fruit that surrounds and protects the coffee bean). You're likely to consume approximately 30 calories per serving or less in these types of products. Lastly, if you make a kelp noodle recipe at home, the calories are likely to be higher, as many recipes include ingredients that are higher in fat. For example, many kelp noodle salads include peanut dressing, which is higher in fat and calories. And a stir-fry with kelp noodles might be healthy, but higher in calories because of the oil that is used for cooking. There are very few carbs in raw kelp. According to USDA nutrition data, there are approximately 9.5 grams of carbohydrate in a 100-gram serving. Fiber accounts for 1.3 grams, sugar accounts for less than 1 gram. According to the nutrition facts provided by manufacturers, there are about 3 grams of carbohydrate in kelp noodles if you consume a 4-ounce serving. The estimated glycemic load of kelp is 4. There is no fat in raw kelp or in kelp noodles (unless other ingredients are added). Kelp is not a good source of protein. There are approximately 1.8 grams of protein in a 100-gram serving of raw kelp. There is less than 1 gram of protein in a single serving of kelp noodles. A 100-gram serving of raw kelp provides important micronutrients. Vitamins in kelp include vitamin K (66 mcg), vitamin A (116 IU), vitamin C (3 mg), folate (180 mcg), choline (13 mg), vitamin E (1 mg), and small amounts of thiamin, riboflavin, niacin, and pantothenic acid. Minerals in kelp include calcium (168 mg), magnesium (121 mg), iron (2.8 mg), sodium (233 mg), phosphorus (42 mg), and small amounts of zinc, copper, manganese, and selenium. Kelp is considered to be healthy because it is a very low-calorie food that provides important nutritional benefits. Kelp is very high in vitamin K, a fat-soluble vitamin that is essential for blood clotting, and folate, a vitamin that is important for red and white cell formation and may also help you maintain healthy blood pressure. Kelp provides vitamin C, an important antioxidant that may help prevent against illness or disease. And while it is high in sodium, kelp also provides calcium (important for healthy bones), iron (important for healthy blood and disease resistance), and magnesium (a mineral that is essential for hundreds of biochemical reactions in the body). There is not enough high-quality clinical evidence to support the use of kelp for these purposes. Some reports describe that kelp is sometimes used as a "tent" (or a thin rod or film) to help dilate the cervix during certain gynecological procedures, including abortion, labor stimulation, and the removal of IUDs. However, there is mixed evidence about whether or not using kelp for these purposes is effective and some evidence that demonstrates that it may be dangerous. Where do you buy kelp? Kelp and kelp noodles are found in many specialty markets. Kelp noodles are becoming more popular in grocery stores and supermarkets in the Asian food section. You can also buy kelp and kelp noodles online. How do I store kelp and how long is it good? If you purchase kelp noodles or dried kelp it is usually packaged so that you can keep it in your cupboard for about six months, unopened. What is kombu? Is it the same as kelp? There are different varieties of kelp. Kombu is the Japanese word for kelp, usually the Saccharina japonica species. Raw kelp can be used in stir-fry dishes, in soups, added to salads, or included in smoothies. Some cooks add raw kelp when cooking dried beans to enhance flavor and make them less gassy. Kelp noodle recipes are easy to find online. Kelp noodles are gluten-free so the food is popular with people who are sensitive to gluten. But you probably don't need a recipe to enjoy the food. Simply rinse kelp noodles right out of the package and add them to your favorite dish—a green salad, dishes with beans, or into a bowl of warm steamed vegetables. Some cooks rinse them first and if you want them warm you can throw them into hot water for a minute. Are Kelp Noodles the Next Wonder Food? Kelp is likely safe when consumed in amounts typically found in food. However, the iodine in kelp can become dangerous if you consume too much of it. Your recommended daily intake of iodine depends on your age and gender. Most adults need 150 micrograms per day. The upper limit is 1,100 micrograms per day. Some studies investigating Japanese iodine consumption (based on their regular seaweed and kelp consumption) estimate that they consume 1–3 milligrams per day. Since the amount of iodine in kelp and seaweed varies, it can be unclear how much you will consume when you eat it. According to the National Institutes of Health (NIH), a single full sheet of seaweed may contain 16 to 2,984 micrograms, or 11 to 1,989 percent of your daily value. If you consume too much iodine you may experience symptoms including goiter (enlarged thyroid), thyroid gland inflammation, and in severe cases, may even cause thyroid cancer, according to NIH. If you consume way too much iodine (several grams) you may experience burning of the mouth, throat, and stomach, fever, stomach pain, nausea, vomiting, diarrhea, weak pulse, or coma. Health experts advise that pregnant or breastfeeding women and those with kidney or thyroid disorders avoid laminaria (kelp). It is also important to look for iodine amounts on the label if you choose to consume kelp supplements, as some contain up to 1,000 mcg of iodine. Munsick R, Fineberg N. (1996). Cervical dilation from multiple laminaria tents used for abortion. Obstetrics & Gynecology, 87, 726–729. doi:10.1016/0029-7844(96)00022-1. DOI: 10.1016/0029-7844(96)00022-1. Laminaria. Professional Monograph. Natural Medicine Comprehensive Database. July 7, 2018. Iodine. Fact Sheet for Professionals. National Institutes of Health Office of Dietary Supplements. September 26, 2018. Jain JK, Mishell DR Jr. A comparison of misoprostol with and without laminaria tents for induction of second-trimester abortion. Am J Obstet Gynecol. 1996;175(1):173-7. DOI: 10.1016/s0002-9378(96)70270-3. Atlas RO, Lemus J, Reed J 3rd, Atkins D, Alger LS. Second trimester abortion using prostaglandin E2 suppositories with or without intracervical Laminaria japonica: a randomized study. Obstet Gynecol. 1998 Sep;92(3):398-402. DOI: 10.1016/s0029-7844(98)00194-x. Zava, T. T., & Zava, D. T. (2011). Assessment of Japanese iodine intake based on seaweed consumption in Japan: A literature-based analysis. Thyroid Research, 4(1), 14. DOI: 10.1186/1756-6614-4-14.